Should the media be restricted in their reporting of mass shootings? Ella Rhodes investigates. Yet there are others with a responsibility to reduce the risk of further shootings: the media. Back in 2009, forensic psychiatrist Park Dietz called on the media to avoid: showing sirens blaring in their reports, using photographs of the killer, having rolling 24 hour coverage of the event, and leading with the body count. Dietz warned that these were all factors in creating ‘anti heroes’ and prompting copycat, one-upmanship: ‘Every time we have intense saturation of coverage of a mass murder we expect to see one or two more within a week.’ The coverage of the Virginia TV journalists shot dead earlier this year during a live report suggested Dietz’s advice had not been heeded. However, unsurprisingly, once the killer’s name was released to the press, hugely in-depth investigations of his background were released. His internet activity, his history and interviews with his distraught father saturated the news while a photograph of the shooter holding a rifle accompanied each separate report. Research supports the suggestion that such coverage has a deadly impact. Work led by Sherry Towers (Arizona State University) and published in PLOS One earlier this year found that there is a ‘temporary increase in probability’ following mass killings involving firearms, lasting on average for 13 days and leading to at least 0.30 new incidents. Shockingly the authors outline that 87 per cent of all children (aged 0 to 14) killed by firearms are children living in the US, despite the fact only 5 per cent of the world’s children live in the country. 6. Bolstering communication within the school (e.g. by introducing a mass text message alert system) and between school and community agencies, allowing, for example, the rapid review of pupils whose essays and compositions may betray signs of mental distress. 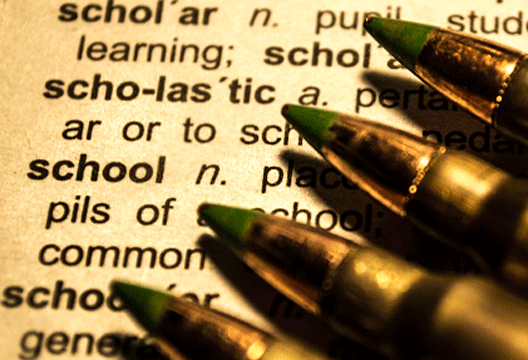 ‘If implemented successfully, programs based on these six strategies are likely to reduce social stratification, increase school bonding, and provide early intervention to ostracized and angry students who, if exposed to other risk factors, may have a higher likelihood of violence,’ the authors wrote. But to turn the spotlight back on the media, is it time for outlets to take responsibility for reducing glorification and sensationalisation? There are media guidelines around the reporting of suicide so why not homicide? Surely a first step would be to follow Sherriff Hanlin’s advice: to not name the killer, ditch his photo and focus instead on the victims and their families. - There have been some fascinating pieces in the media since the shooting. This is one of the best, on the race to stop the next mass shooter.